Family Math Night Agenda & Reactions! Tomorrow is the big night. At 7:00 PM, prior to the PTA’s meeting, myself and my colleague Mr. Rodinsky will introduce our curriculum to parents and possibly students. I read the blog post by Illustrative Mathematics and some of the slides from our True Talk with Open Up Math Gurus Global Math Department webinar. Write down phrases and words from students and parents on chart paper. What did it feel like to do math tonight? What felt different from your school experience? How might this approach improve learning and understanding in math? After writing up that overview of my slides, I’m starting to think about trimming down on some of the details that I think interest math teachers more than parents. Any feedback is welcome, I will revisit this blog post after the meeting happens tomorrow. Also, this was one of my professional goals to reach out to families and improve the line of communication about what is happening at our school and inside our classrooms. Family math night went great! It went for about an hour, than an extra 10 minutes for some answering of questions. Thank you to the PTA for providing time before their meeting for it. I think it’s a great idea to partner with your parent association to make events like this as successful as possible. The opener was great. I wrote what students and parents were shouting out in orange. Then at the end, when we reflected on the math we did and this original question, I circled ideas that we did. Parents weren’t sure we had done geometry, until I lingered before circling and then they realized that the distributive property was the area model of a rectangle, which indeed is geometry. I also asked, are there words or phrases we can now add to this list? Those are written in green. They said that they were “cooperative, collaborative, challenged, visual, think time, etc.” I asked if I checked for their understanding; which was the cool down exit ticket. The curriculum program overview went well. I didn’t talk much about the Math Language Routines because I think that would have been more depth then what was necessary. We then looked at the learning goal of Grade 6 Unit 6 Lesson 9. I remembered to give the parent and students credit by writing their names next to their method. One parent came up to show how they did the standard algorithm. Before I had them start activity 1, I reinforced how their methods were basically the area model, decomposing a rectangle into pieces. Then we reviewed the answers. Like I anticipated, parents weren’t used to seeing a prompt that says “select ALL the equivalent expressions.” As I walked around, some people had stopped after getting one answer so I prompted them to look at all choices. I also made a connection to SBAC testing where they will see these types of questions, as well as on the End of Unit assessments. After starting the activity synthesis with an answer they were confident with, I followed up with then what can we eliminate and why? Then I had everyone start on the next activity. I wanted to model Think Pair Share, so I asked everyone to work quietly and individually for 2 minutes, then I asked them to work with a partner to see what ideas they had come up with. I cut them off about 4 minutes after that. Now I wasn’t going to discuss all the correct answers, so I opened it up to ask what interesting patterns or structure they saw. One parent said they liked the last 2 rows because it was challenging. I asked them if there was only one correct way to do the last row? He said no. So I agreed that I thought it was kind of a cool potential conversation to have about multiple correct ideas. On the flip side, a parent spoke up and said that they didn’t see the value in the last 2 rows. They felt it would confuse students who don’t understand the basics. The parent thought that if you know 9+12, why do you need to go backwards and fill out the rest? I tried to explain that if students see non-routine problems like this, they can deepen their understanding and understand the structure of the distributive property if they can go backwards as well as forwards. Please add any suggestions in the comments about this. I also mentioned that the 3rd to last row had fractions, which was a great time to review content from Unit 4. The row above that was decimals, which was a big chunk of Unit 5. Another opportunity to review. I told my audience that this is what makes this curriculum so special, and the top-rated one in the country. The people that designed it are smarter than me. I trust them. My old brain thinks when we finish a Unit, we are done with that topic, and I kind of freak out. my new brain has not freaked out as much this year because now I see that topics are revisited. They especially will be revisited if you make time to have students do practice problems. Later in the Q&A session the parents were wondering about lack of homework. I said that that the homework policy is up to the teacher. Personally, I said, to deliver the best and most thorough lesson possible, I can’t if I’m spending time checking and discussing practice problems. Therefore I do not assign them, but do for a study guide before a unit test. I then discussed how we did the lesson synthesis as a class, but didn’t spend time on it. Then we passed out the cool-down to show how we check for understanding, and then reviewed the answer quickly. I should have discussed it more, but I had this hung up and barely discussed that these were sentence frames that help ALL learners. D’oh! Forgot that. I did give 1 minute of quiet think time, and then had people share. I also reminded everyone that there was a reason why each did not belong, and that you are correct as long as you explain why it doesn’t belong. One parent said the top right didn’t belong because it wasn’t the same equation as the rest. I saw a parent in the front row who had solved all the equations before I even had talked about the prompt. So I asked him if he could provide evidence based on the work he had done earlier. He showed how the top right got a different answer then the rest. So, I infused some vocabulary and said that it was the only one that didn’t have the same solution. One person said the bottom left had a dot, the rest didn’t. I reiterated that in 6th grade they lose the dot and start writing “next to notation” like 4x. This can be a bumpy transition. Then I briefly talked about the card sort that followed, and emphasized that there were different correct ways to categorize the cards. Finally, I talked about the 8th grade activity of taking turns solving equations. They saw that that reinforced more collaboration, and allowed some room for choice, partner practice, and finally individual practice in class. Then I modeled how to go to the parent section of the Open Up Resources web site to see the explanation of the topic, and a task they can try with their kid. Another question was what curriculum would students take for Algebra 1 in the 8th grade accelerated course next year? I did not have an answer for her yet… because it is not clear if Open Up Resources Algebra 1 by IM will be ready by the fall, and it could possibly be MVP math in the fall, the other curriculum that Open Up will be publishing. I will definitely be using some of the materials on Unit 1 from the IM blog post I linked at the top of this blog post earlier in the year to set students and parents up for success earlier in the year. Author mrjoyce180Posted on April 8, 2019 April 10, 2019 Leave a comment on Family Math Night Agenda & Reactions! I am a big fan of Open Up Resources 6-8 Math’s Unit 5 in grade 8. The unit is broken in half with a mid-unit assessment that deals with functions. I also saw a student finally understand slope after it was introduced in Unit 2. This curriculum really does revisit concepts later on! In the second half of Unit 5, students carefully learn volume. They make connections to volume of a prism from 7th grade, and a warm-up reviews all of Grade 7 Unit 3, Circles, in about 10 minutes. Once again, they try to address “unfinished learning” and assume students are rusty and forgot. Students and teachers alike appreciate this, I can attest to this with my own opinion and surveys from students last year. It also launches the second half of the unit with Lesson 11: filling containers where students have a hands-on activity filling up various amounts of water in a graduated cylinder, collecting their height and volume data, and then graphing it. Here they reinforce volume depends on height, and it’s a proportional relationship. Revisiting previous learning, in a new context. In Lesson 12 students do a lot of estimation. Of course I love this since I used to do Estimation 180 everyday for my warmup. It also gets students brainstorming about units that volume is measured in. What I really like the most is students don’t jump straight into finding the volume of a cylinder. They actually work on finding missing dimensions of a cylinder, and later a cone, to really get their feet wet looking at the structure of the V=B*h formula once it’s expanded into V=pi(r^2)(h). How Many Cones Does it Take to Fill a Cylinder with the Same Base and Height? from Open Up Resources on Vimeo. At the top of the board you can see how students estimated if a sphere was less than half, more than half, or equal to half the volume of the cylinder it was inside. I suggest a private heads down vote to get truthful and diverse opinions. Then after the video they know if their first intuition was correct or not. Before tackling hemispheres and spheres, students looking at how the graph of scaling one dimension (height) and two dimensions (the radius, since it’s squared). This reviews a concept that I know my students I had in seventh grade last year struggled with. Seeing that when you scale a shape by 2, the area is scaled by 2^2, or the square of the scale factor. This is revisited here. Next time I teach this unit, I’ll make sure I give enough time for them to finish their graphs, because I stuck to a lesson a day for those and kids were pretty slow at it since they had to compute some values, then set up axes, then graph it. volume of cylinder sphere and cone from Open Up Resources on Vimeo. I did see this video on twitter from Cathy, but I still like the video above because it includes all 3 shapes and their relationships. This video omits cylinders. Note to self for next year: have all students with phones download the Desmos Test Mode app. This allows them to use their phone as a calculator, but locks it and uses a timer so they can’t get their Snap Chat alerts or switch to other apps. Unit 5 lesson 21 involves a lesson synthesis where groups of students answer 8 essential questions. We didn’t have time to complete this in 1 day, so it extended to 2 days, which I attribute to working on an info gap routine and synthesizing the activity by discussing the two methods of solving for a missing volume and finding missing dimensions. Day 1 was the warmup, info gap, and assigning pairs of partners to at least 2 posters per question. Day 2 was finding the radius of a sphere given the volume, an optional activity but definitely worthwhile to reinforce how to deal with a 1/3 or 4/3 in an equation. Then students presented their lesson synthesis questions by standing up as a group. One way I modified this was each table had one question, but they worked as 2 pairs to complete the work so more than 1 person could be writing at one time. I also didn’t want each poster to be the same work, just different examples. This worked out pretty well! In each class I tried to focus on this poster, because it was a big question and concept on the upcoming Unit 5 test. I had a great time presenting about this topic at CMC South and North. I was scheduled to present it at Taste of TMC Norcal but my time slot was the same as Howie Hua and Paul Jorgens & Richard Hung so no one came, which made me happy because I got to see Paul and Richard kill it with Desmos and Open Middle activities. I did want to submit this proposal to NCTM San Diego, but I couldn’t justifying the funding. I did submit this proposal to this years TMC (Twitter Math Camp) being held nearby in Berkeley, CA. What did this session provide that will positively impact the teaching and learning of mathematics? I loved this! I was so engaged, and my students will LOVE this! Adaptable to any level!. I loved it! I will take this activity back to my class next week. How to utilize Desmos for students to create something tangible. I enjoyed seeing something different, that’s practical but uses technology. Would you attend another session by this speaker? Did the session match the description in the program book? Provide the presenter with constructive feedback to help them grow as a presenter. Excellent amount of time for practice and playing with the program. Perfect…..as always we could use more time! Having a document that outlines the steps would be helpful to see the big picture of the whole process. 460 Martin Joyce Excellent Completely Just a bit fast at times; perhaps slower for those who have never used Desmos. Yes, regardless of topic Yes Fun! The learning experience was enough prompting. I will try this with my own classes, but without the 3D printing options for now. Before I head down to CMC North after work tomorrow with my colleagues Bob and Allan, I need to summarize everything I learned from CMC South a month ago before I arrive at Asilomar tomorrow. It was my first time at south, and when my speaking proposal for 3D printing Desmos graphs was accepted, I was beyond excited, and a bit intimidated. I had never flown to a concert. I spoke at Asilomar and CPM’s national conference last year, but CMC south was uncharted territories. It lived up to and beyond the hype. I own Routines for Reasoning already, and I arrived early to introduce myself and she signed it. Grace is so nice and personable. Her name is pronounced “Kelluhmanick.” I also met someone I know from twitter at my table, Megan, @meganjoy5, and met Deborah. Megan shared the same admiration for Sara Vanderwerf and her name tents and Megan was raving about how stand and talks made her usually quiet students speak more. I have to watch that Global math on it at some point. Back to the opening session. The goal was to learn how to facilitate productive math conversations. Why do we want students to learn how to discourse? Students construct knowledge socially. She played “Let’s give them something to talk about” by Bonnie Ray. We were also reminded how important it is for teachers to have a poker face when listening to ideas so we don’t immediately give away that the answer is right, or wrong. Instructional routines are great for many reasons. They have a predictable design, and students get better at it the more you practice it. Her website is fosteringmathpractices.com. My biggest takeaway was this: in contemplate then calculate, the first pair of students that share have a sentence starter: “We noticed…” When you listen to them, you gesture to the dot talk image, do not write. Then, ask the rest of the class to restate their thinking with this sentence starter: “They noticed… so they…” THEN you annotate. I love this move so much because it keeps students accountable for knowing what others say, and you only write it when someone else repeats it. It’s important to be explicit about the goal: how you learned to think like a mathematician in the future. Daniel Rocha was given an awfully tiny room and I was rejected due to fire code and not being allowed to stand. He gave me the link to his slides at bit.ly/Rocha_CMC2018. I had never seen Robert Kaplinsky present, but I had met him at NCTM SF a few years back. I have also liked his Ignites when I watched them online, so I was excited. He was in a huge room with a lot of attendance. His session had us ranking lays, nacho cheese doritos, cool ranch, cheetos, sun chips, and fritos from 1-6 to see how they could distribute them in a variety back to maximize profits. We also looked at a task of a large drug bust of money. We estimated how much money the huge brick of 100 dollar bills would be. They flashed it on the screen briefly, just so we could discuss what we noticed. It was great because it didn’t make you quickly solve. I think this was Contemplate then Calculate, #cthenc, again, but I was glad it wasn’t a dot image. My reflection was, “to find a calculation shortcut, look for relationships between numbers and see if they are divisible by a common factor. In our group discussion, it came up that shortcut had a negative connotation. So we brainstormed replacements: elegant or efficient” method. The audience here was great because I got to sit with Casey, Chrissy, and Michael Fenton was there too. They had a huge Desmos activity builder that they ran the presentation through and it went really well. Tons of cool little activities that showed the progression of geometry from area of rectangles to much more complex shapes. We did a paper and pencil Steve Wyborney activity. We also used the Desmos sketch tool to find area. We were creating formulas by decomposing and rearranging. My session! I was first one of the day, and it was great. I think I’ll have a separate blog post about that. I was surprised by the great attendance, at least 60 people and I got great feedback from people in person. Here we did some role playing about lesson study. We watched a group work on an open ended problem where figure 1 is 1 tile and figure 2 is 8, and watch what they could come up with. We were attending to status, sharing a student’s idea for the class to consider, and they are trying to abolish the phrase “I’m not a math person.” I recognized Katerina’s name and I was right, she is the same person who wrote the Functions unit with the border problem that’s on YouCubed! I follow Rachel on twitter (@mathematize4all) and know she is well respected when it comes to students with disabilities (SwD). She asked us what problems we see in math teaching and learning for these special populations? Cognitive deficits, achievement gap, SwD not offered access to standards-based instruction and not participating deeply. I can honestly say I’m so glad our non-mainstream classes are using the same Open Up curriculum with more support and a slower pace. That’s awesome news to report. What are her main takeaways? We need to change the way we think about disability. We need to offer intervention in our classroom, build relationships, see student strengths, invest in problem-solving routines, and provide scaffolds. Then she talked about UD, Universal Design. It is when we design anything we want to expand the group of people who use it. We need to students to participation in math discussions because this predicts achievements. They need to engage in the strategies of their peers. Without supports, SwD participate less actively. The SMPs, or Standards for Mathematical Best Practices are best practices for ALL students, SPED, EL, everybody. Rachel researched a 5th grade classroom where they had a consistent routine of number strings and CGI story problems. They worked on fractions, partitive and measurement. They noticed that SwD are more willing to share if they are collaboratively sharing in front of the class with their partner, not standing by themselves. Amy co-authored Routines for Reasoning with Grace. She was also gracious enough to take a picture with me and sign her book. When students work within contexts, they are using MP 1, 2, 4. When they communicate their ideas: MP 1, 3, 6. When they connect ideas and representations: MP 2, 4, 5, 7. And when students abstract and generalize, they are using MP 2, 7, 8. We can ensure all students are doing these by using specific routines that support students in how to communicate effectively. That is interconnected and makes sense. How can we support our special populations? Give them avenues for thinking. Like helping their quantitative reasoning. A quantity is something you can count or measure. It has 3 things: a value, sign, and unit. A simple tip like giving a sentence starter like “The number of…” helps students track important information in problems. We then did a dot talk. We looked for repetition. I came up with the equation 4(N-1)+4 by visually looking at the pattern. My reflection was: when looking for repetition, I learned to pay attention to how groups of dots being added is related to the figure number. Friday night pizza was a lot of fun, and it was great taking selfies with all the people I talk to on Twitter. It was also shocking that people recognized me from Twitter and as the guy who is the “Open Up Math guru.” CMC South was awesome and I hope to go every year. The fact that they cover your travel costs is a huge motivating factor. Now that I’ve blogged about my experience, I can come back to these notes and actually use them and now create more space in my brain for this weekend: Asilomar! Dan Meyer, author of many 3 act tasks, presentations, & Desmos CAO checking out an #openupmath lesson I taught! Not a math teacher, but our music teacher Mancho. There’s music in math! A few of my math department members: Carrie Wong, Jessica Yee, myself, Jonathan Lee, and Bob Rodinsky. My plan is to continue to add to this list. I obviously don’t have pictures with everyone I know, but plan to! Open Up Resources 6-8 Math Grade 8 Unit 2 Lesson 13… Math routines & cool-down comment codes! Today was the culminating lesson of Open Up Resources 6-8 Math grade 8 unit 2, lesson 13. I wanted it to go better than the last lesson of Unit 1 went with students not really getting too far past the warm-up activity of exploring angles of pattern blocks. 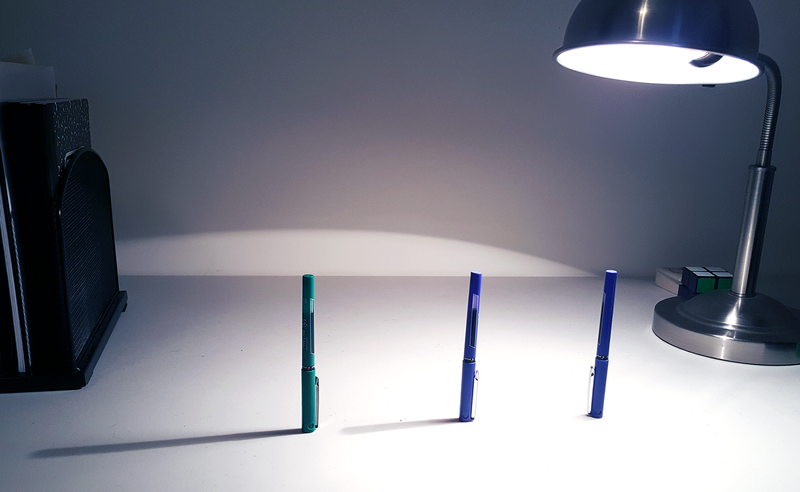 This lesson started with a notice and wonder of 2 photos of 3 pens, one outdoors with equal shadows and the other indoors with a lamp as light source. Students were very intrigued. I’m glad that someone from another class also noticed that the bottom photo created slope triangles. Also, a few noticed the direction the sun was shining based on the direction of the shadows. In the slide show the next photo draws lines from the light sources to show the angles created by the shadows indoors are not equal but the light rays from the sun outside create parallel light rays that make the angles with the ground equal. Before jumping into the lamp post activity, I re engaged students with the lesson 12 cooldown that challenged students to check if a point was on the graph of a non proportional equation. When students took the cool-down, I prompted students who were stuck or blanking out to try to find the slope of the line. Before looking at each classes results, I worked the steps myself to guide my thinking of how students may approach the task and to plant a seed on how I wanted students to re-engage with the task the following day. This is where I created some comment codes, that I’ve talked about in our weekly Open Up Resources 6-8 Math chat at 5:30 PST every Monday, and many people have inquired how I do it. Here is a perfect example to show. Students received an “S” if they were unable to identify the slope of the line. If they did figure it out, no “S” code. If they weren’t able to set-up an expression or equation equal to the slope, they got an “E.” If they didn’t check if the point was on the line or incorrectly used their expression or equation (switching order of ratio, switching x and y coordinates) they got a “P.” So the less codes you got, the more you understood the task. My general marking codes are similar to the ones I learned in MARS tasks: check mark for correct, x for incorrect, and ^ (caret) for correct but incomplete thinking, that wouldn’t get full credit on an assessment. To re-engage students the next day, I asked students if this was a proportional relationship. They said no, it doesn’t pass through the origin. Some kids divided the y coordinate by the x coordinate to see if they would equal to the slope, 1/2. They were referring to the classwork activity a day before where the line was y=3/4x. So, I asked the class what the slope was. Many said, 2/4 or 1/2. I then asked raise your hand and prove it. So many talked about drawing a triangle between two points, and labeling the vertical and horizontal lengths, and writing vertical/horizontal. I asked students to call out lattice points, points that were on the line and exactly on the corner. As they called them out, I marked and labeled them. I then labeled how the student volunteer found the slope, and pushed students to see how the slope was related to the pair of coordinates. Kids saw the vertical was the difference between the y values, and the horizontal was the difference of the x values. I have to show what this student did. Although there’s no equation, the SMP’s are evident all over this with the perseverance, and the repeated reasoning of a pattern. My students asked if I was the guy in the middle. I did admit that this gentleman is the same height as me (72 inches or 6 feet), although he has 2 sons, and I have 2 daughters much younger. Most kids found the approximate constant of proportionality (1.5), but in my first class, one student had a REALLY clever way of finding the lamp post height. I mentioned him, Carson, in later classes to show students there was an alternative method. 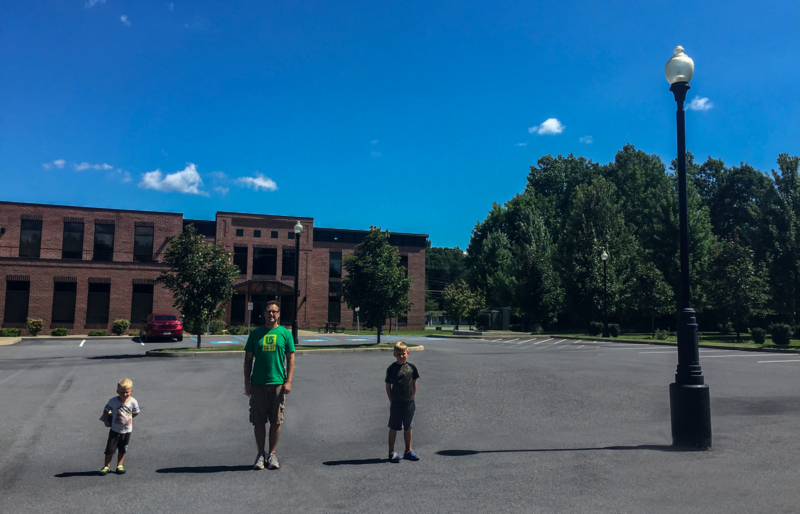 He got his protractor and measured the man’s shadow and got 2 centimeters. He then measured the lamp post shadow and got 5 centimeters. He reasoned that 2 times 2.5 is 5 centimeters. So, he said that the lamp post must be the same size of 2 and a half men! He said 72 plus 72 is 144, and half of 72 is 36, so 144+36 is 180, which is pretty darn close to the answer students got of 171 inches when multiplying the lamp posts’ shadow by 1.5. The next activity is pure genius. After that activity synthesis, it fades out the photo and draws black lines on the angles created by the people and their shadows. Students are given 2 minutes to come up with their first rough draft explanation of why there is an approximate proportional relationship between shadows and heights. This was my first time I was going to use the MLR 1 (Math Language Routine), Stronger and Clearer Each Time with successive pair shares. I first experienced this routine at Asilomar last year in Chrissy Newell’s session that was right after my session. I didn’t follow the instructions exactly how I was supposed to, after referring to the Course Guide outlining the procedure, I realize that students were supposed to think about what they were going to say to their partner without looking at what they first wrote. I will read through that again before I try this great routine again. When I executed the routine, having cards taped to each desk for random seating really helped. Students matched up with students at the table across from them with the same suit to share their thoughts, listen to their partners, and critique each others reasoning and add to what they wrote (some had wrote nothing in their independent time). I could see students who usually didn’t produce as much work output, working harder to incorporate notes from their partner’s ideas. I then had them think and write a bit, then pair up with a different table. This really helped in the activity synthesis because students were more willing to share one idea they had. The main point to drive home was that the shadows and objects created triangles that were SIMILAR. Yes, they were all right triangles, but that only proves that which angles were the same? The 90 degree one. So, students, how many pairs of angles must be the same to be similar? (2!) So, how about a second pair? They saw that they were corresponding because the light rays appear to be all be parallel. This means that the side lengths are proportional to each other, and are scaled copies. Then students went outside with clear roles: 1 student would stand, whoever knew their height by heart. Two students would measure with a meter/yard stick, and the 4th group member recorded the data. Then they measured the shadow of a tree or a tall object and then went in to do their calculations. We ran out of time, and one of my classes had inattentive behavior that slowed the flow of the class period which made me omit the outside portion and just have a longer conversation about why the relationship was proportional. I am really happy with how this lesson went. With this curriculum, Brooke Powers reminded me that my students are making memories of learning experiences in math class that I believe they will remember and recall later on. I really am happy with how students consolidated and applied their learning in this culminating unit 2 lesson. I am also excited to try successive pair shares (MLR 1) again with a different concept. Author mrjoyce180Posted on October 27, 2018 October 27, 2018 4 Comments on Open Up Resources 6-8 Math Grade 8 Unit 2 Lesson 13… Math routines & cool-down comment codes! I felt that this lesson was a great introduction for students to grapple with the language of ratios and to see them come to life. The warm-up is such a great start to the lesson. I don’t have it pictured here, but basically there are different colored shapes with different areas and arrangements of squares. This is where having the consumable workbooks from Open Up Resources really comes in handy because they are printed in vibrant color! It gets students thinking about what color categories they could be sorted into, as well as how many groups that is. Then they sort by area, and then come up with their own sorting. One student named all the types as small rectangle, square, big rectangle, small L, big L, and I forget what they called the other two shapes. Others said rectangles and non-rectangles. After this, students sorted their own collections. I had at least one collection per table, but one group no one had brought any in so luckily I had some of Christopher Danielson’s wooden tiles to sort. Sorted! And you can see the warm-up question in the background. Here’s their categories and data. I love how they named the pentagons crowns. Then they were like, hey they fit together! Afterwards, they were given an exit ticket (cool-down) with pictures of cats, mice, and dogs. I was really impressed how well students were able to apply the knowledge of the ratio sentences and the reference on the poster was a huge help for all learners. This lesson was an exciting launch into Unit 2 on Ratios! I have taught all levels of middle school from 6th grade math support to Algebra 1 to accelerated 8th graders. This blog showcases student work, lesson reflections, slides from presentations, and more. P.S. I started this because the Blogger app for using Google’s blogspot.com service is awful, and WordPress has a wonderful iPhone app that allows you to quickly upload images to slides efficiently.